Well, to kick off this project here’s where it all starts. 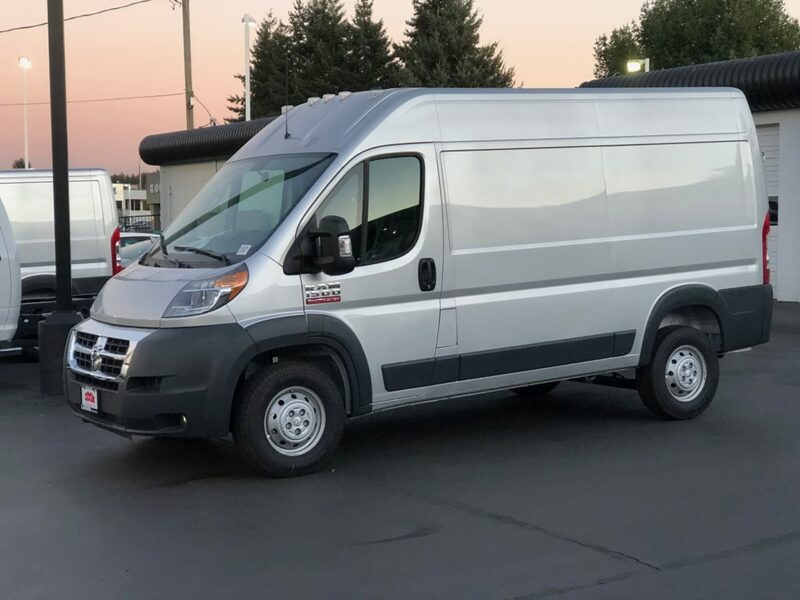 I picked up a 2018 Ram Promaster. 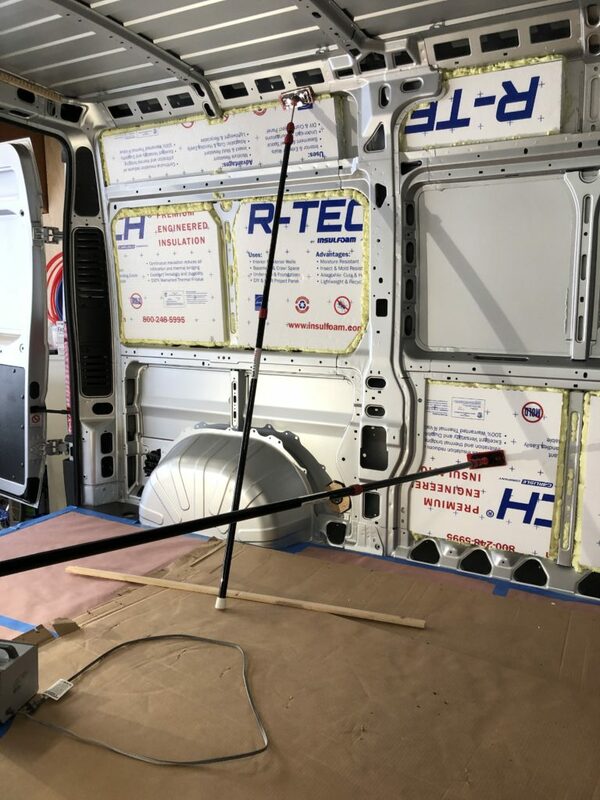 It’s a 136″ wheelbase van (the shorty) which will make a nice cozy platform to build out our traveling van. 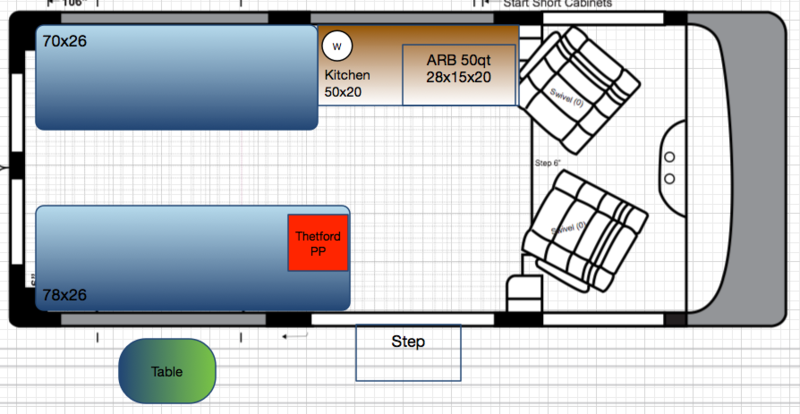 Here's the current plan for a floorplan. Thanks to https://www.buildagreenrv.com/our-conversion/ for the ideas. While we looked at a platform bed, it just took up too much room if not setup crossways in the back. The cross bed solution was too short for my liking. Also we wanted to be lower to the ground with the beds. We will see how it goes as we start building things out. Con no large “garage” storage area, would have to use under the beds. So essentially gives up storage space for isle walkway space. Con Bella the beagle “might” have to sleep on the floor. Which she would vote against. 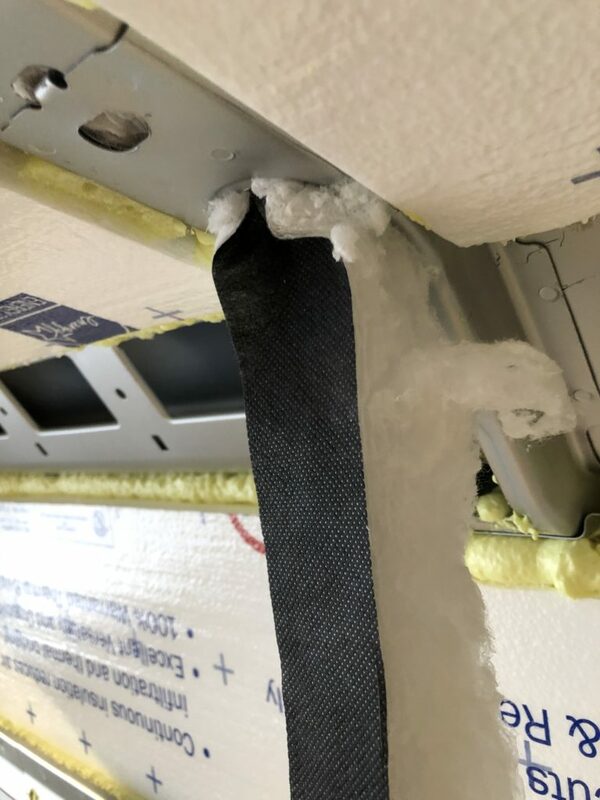 Insulation was fairly straight forward. I used Ridged polyiso and great stuff windows / doors with a pro gun. By the book as far as I can tell from my forum history lesson. 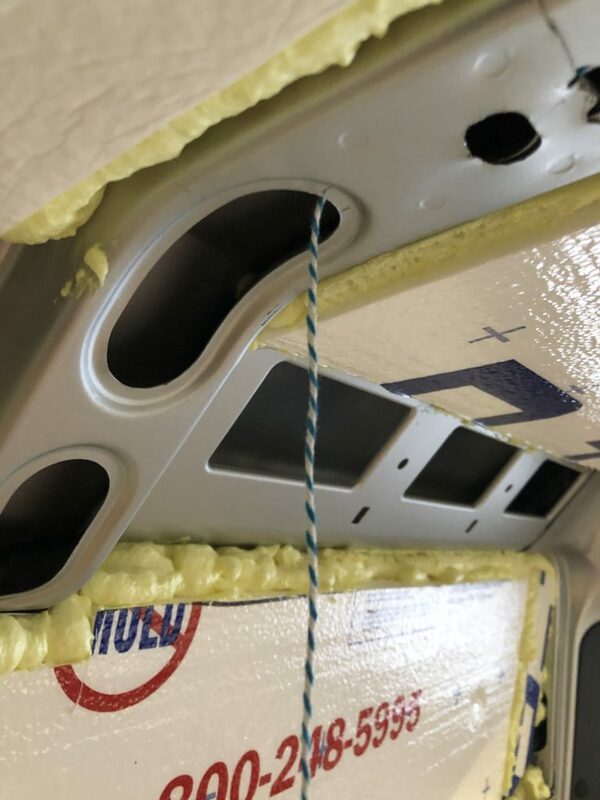 I'm using some 3m thinsulate in the ribs (after wiring) and in the door panels. I also installed it above the front headliner storage area. Looks like a nice set-up. FYI … 118" wheelbase is the shorty. Easier to insulate the ribs first . Next the wiring . A couple of conversions on here have bunk beds with the top a fold up. I have seen three and liked them all. You might look at these to think about it. There may be others with over and under bunks. Unfortunately the full bunk bed idea is not going to work for us. My wife needs easy floor access in / out of the bed. It's the primary reason I ended up giving up on the rear platform bed layout. While I liked the storage of a garage underneath, there was just too much climbing, steps, crawling around to work for us. The design I really fell in love with was the partial bunk cross. Mike & Molly did a magnificent job with this one! but in the end I think we will do fine with Gary's more simple layout. Time will tell, and hey, as Keeponvanning did you can always change it up in the future. Akarmy, your layout is the same as ours. We built it in a 159” WB, so our galley is 48" long with a nice space at both ends for stowing guitar cases. Our galley is a cabinet, and a cupboard above. We use camp stoves, dishpan, and cooler, so it is indeed a casual camper, not an RV (we have one of those that gets less and less use since the van). Like you, the bunk on the sliding door side is a few inches longer, hers on the galley side is the short one. Our bunks are 24” from floor to bottom of bunk platform. We left the minimum space we could tolerate between the bunks, so the mattresses are 30” wide, and the floor between the bunks is 15”, just enough to be able to walk/scoot between them. I would not change a thing after 18 months with this layout. We copied MsNomer in building so all cabinetry can be broken down, except those around the wheel wells where fishing gear and electrics are located. The broken down bunks take about 8” of space along a side of the van, so when we want to transport things there is plenty of room. We are still happy with the layout and would probably do the same thing if starting over again today. Still like the open feel of it all and easy in-out of the beds/seats day or night. Since we rarely use the back doors, we now have removable shelf between the beds for about the aft 18 inches of the beds -- acts as a sort of night stand with a little more easily accessed storage under the shelf. Its made for very easy removable so I can carry large stuff (like plywood sheets) in the aisle. If I was starting over, one layout I would take a look at is to build right into the sliding door area and make the back doors the primary entry/exit doors (ie don't use the sliding door for entry exit at all). With a good step, the back doors (I think) would make an easier to use door than the slider (which is kind of a pain), and it gives you more area you can build into. Not sure if this holds up to detailed analysis, but might be worth mocking up. Today I added the Thinsulate into all the ribs across the roof, the side channels at the top of the walls, and into the frame and tight areas on the rear and side doors. Ended up running out with a few more spots I need to fill, so I'll have to get an order out to wrap it up. First I took some needle nose pliers and finished closing the tabs that hold the roof ribs together. Without that it's hard to pull much through them. Then I fished the channel with my wire fish tape and pulled some string through. 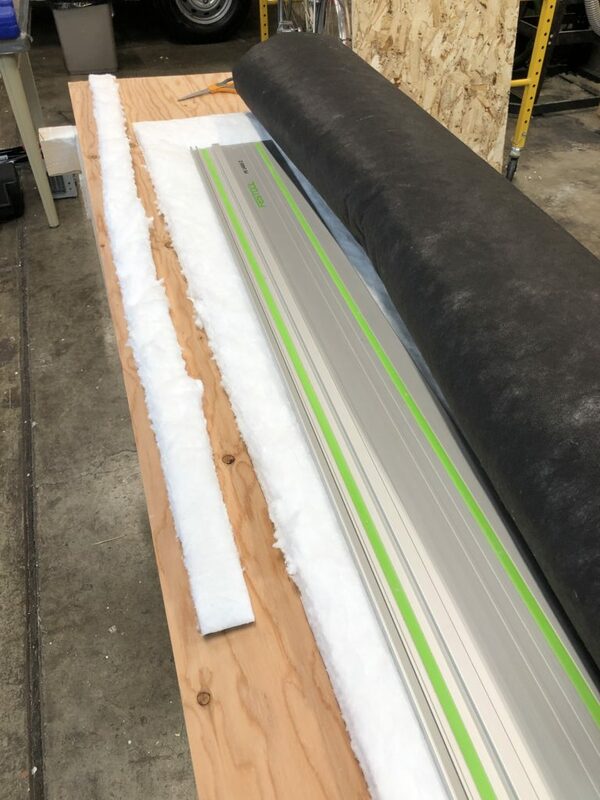 It was easy to pull in the 60 in x 2 in strips. Same process worked for the horizontal chases, and the doors. Since we rarely use the back doors, we now have removable shelf between the beds for about the aft 18 inches of the beds -- acts as a sort of night stand with a little more easily accessed storage under the shelf. Cool, I was thinking about this as well. I also am considering putting a wall in the front side to make that into more of another garage space accessed from outside. Figured it might be a good place to put a rubbermaid bin with Hatchet and other outside stuff. I would make all of it removable in case you wanted to either haul things, or access via the rear. Maybe start with the top like you did Gary, then see how much the underside is used. Might also make a good spot for the dog's bed.